Japanese survivors of the world’s first nuclear attack on Hiroshima voiced regret today that the American pilot of the plane that dropped the bomb died without saying sorry. How significant is the acto of saying sorry? Would it have helped if Tibbets had actually said sorry before he died ? What if he had just said it because people expected him to, but he never really meant what he said. Would it in any way, shape or form lessen the suffering of those who survived and whose lives were changed forever ? This is not the same as e.g. The Unabomber or Timothy McVeigh saying sorry. They did what they did out of their own will. No authority or person forced them to do it. But Tibbets was following military orders. His mission would end a war, change how war’s fought and even change the world. 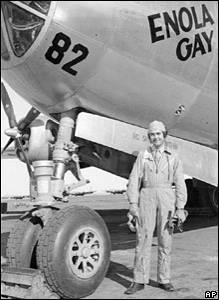 But of the 14 aviators who flew and crewed the B-29 Enola Gay that would drop the Little Boy on Hiroshima, much of the truth was known only by Tibbets. “He was the only one who knew the full story,” said Bill Wilcox, a Manhattan Project member and historian. I personally don’t think it would make any difference if he apologized or not. Yes, if the US apologized as a nation, that would have a larger, more poignant impact.